Hi there sweeties! I’m so tickled to say that you have been anticipating something in the mail from me, it’s finally on the way. Everything was put in the mail earlier this week! I had quite the backlog of domestic and international mail and tied the post office agent up for about 20 minutes! Pop over and check the Giveaway Page – you’ll see that we have a new winner for last Friday and all other packages have gone out. Now to catch up on my backlog of messages! Oh, and you’ll want to stop by tomorrow, I have a couple of first time downloads. For your comment today – what’s the first thing you do when you are creatively stuck? Listen to music, watch tv, take a walk? Heartfelt thanks for your patience if you were waiting for me for a package. I’m relieved to have that behind me. I hope you planning a glorious weekend and thanks for popping in today! Such a beautiful card Becca , When i have ran out of ideas i always go to my friends Blogs that i follow like yours , i always find ideas and inspiration. When I’m creatively stuck I watch YouTube videos, watch TV or read. Sometimes watching what others are doing sparks something that will get me back to creating again. Sometimes just taking a break from crafting helps. I discovered this during our recent move. I had no craft room for about 6 weeks and other than coloring (I did leave out pre-stamped images and Copics for part of the time) I was on a crafting hiatus. It was refreshing and when I could finally craft again I had a new spark. Another beautiful card Becca. Love the elegant simplicity. When I’m stumped, I go back through some of my favorite card creators’ blogs and look at some of their designs to get an idea I can put my spin on. When I’m stuck on a project, I usually spend time cleaning up my supplies. Not only doe sit improve my space, but looking through everything I have with an eye to keep or toss also shows me those items that would look good on my current project. Of course, once that happens, I go back to the project, so there’s always more cleaning to do! Blessed Friday and a wonderful weekend! Thank your for a chance to win this beautiful card. I love this card because it’s doable in a short time frame. It is lovely and will touch a heart that receives it. This card is so beautiful and simple-I love it! Good evening Becca. I always go for a walk. Also look on Pinterest. Love your card today. A very soft colour combination. Quite elegant. A very pretty card I love the colours used. Your bow & flowers are stunning love it all. What a lovely card. Like you said, so simple….so beautiful!!! Even I could make one like it. If I am stuck, I browse the blogs of designers that I follow (such as yourself) & that usually gives me a jumping off place. If that doesn’t do it, I might do something physical, like walking or talking with a friend, & then visit Pinterest. If I am overwhelmed, I ignore my craft room for a few days & then begin again. 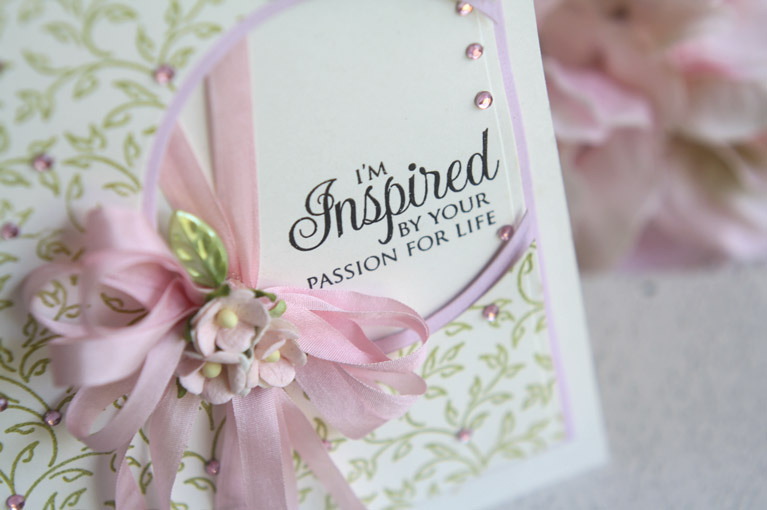 Beautiful card Becca….have cased the design for future reference! When I get stuck for an idea I go back to card pictures I have put on my desktop for inspiration….if I am really in a crunch for time, I PRAY! Works every time! Hi Becca such a beautiful card clean and simple but fabulous. Looking forward to seeing what you have to show us in the coming weeks. Lovely card! Beautiful pink and green combo! When I get stuck there are several things I do until I get inspired. I look at my stash, watch Create and Craft and Paper Wishes, look at magazines (Tattered Lace, Hunkydory, Crafts and Things or any one at Barnes and Noble), look at Paper Wishes, and now (I’m new to blogs)look at your blog, Spellbinders and a few others like Stephanie Weightman and Flowers, Ribbons and Pearls. I hope this helps! If I just can’t even get the energy to want to create, I pop on down to the beach/ocean and renew my spirit on the beach- no matter what the weather or season. Beautiful card, as always, Becca. If I get stuck for ideas, I go through my old dies and embossing folders which I haven’t used in ages. Then I’ll walk away and go back to it, which generally works but If all else fails, I’ll trawl through some of my favourite blogs (yours truly included!) for some inspiration and end up doing something totally different! First of all, your card is “simply” beautiful and very elegant. It is not over the top but is just right. I have two ways I get my juices flowing. #1: I look at colors, usually papers or patterns in the stash. I have a small shelf with colored paper and just looking usually begins the triggering process. #2:I have several craft catalogs and magazines I thumb thru when I am stuck. I am not looking for an exact idea just inspiration. Hi Becca. LOVE this card! The first thing I do when creativity shuts down on me is to fire up Pinterest. I can get lost there for hours, so I limit myself to specific brands that I have in my arsenal. It doesn’t take long to get moving again. When I have a complete mind blank I go and look at my sentiment stamps and search for something that fits with the occasion or for the person concerned. It seems to flow from there. Lovely card, Becca and pretty paper too. Your post is another wonderful reason to look forward to Fridays! I just love this sweet card. You frequently design cards that allow me to consider new possibilities, as with this one. The aperture of the circle extending to the edge of the layer is really visually interesting and the jewels providing closure are really elegant. I have learned that being tired is a creative-buster. Sometimes just perusing through my stash will spark ideas but, if I am totally at ‘square one’-searching Pinterest works every time! Thank you Becca for being you! 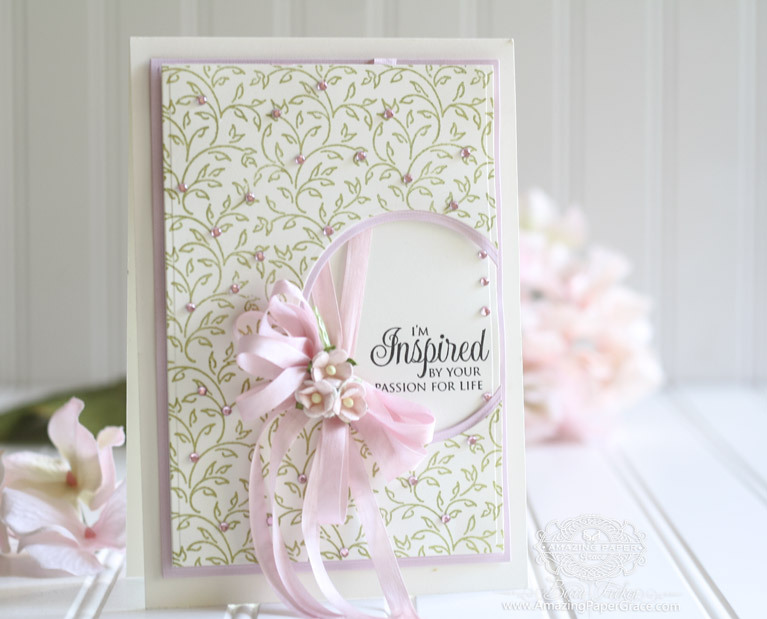 Your card is both simple and elegant, so pretty! What a beautiful card as always. look thru the carsd I have & pictures from the convention. I usually take a break from my project and come back at a later time to finish. It usually works for me! Such a lovely card and thanks for sharing with all of us. Morning Becca oh I remember this card and thought it charming. The first thing I do if I am stuck is go to Pinterest and scroll through , if I see something I might try and make it a bit differently. This card is very pretty. When I get stuck for ideas I go to Pinterest. Your cards also give me a lot of inspiration. I also do a search on your blog on the die that I am using. This usually helps me get back on track. Oh Becca, that card is so pretty! Love the soft colours. Just STUNNING! Its funny you should ask this today! I have been ALL week trying to complete a card for my sisters 60th birthday. I have taken a LOT of baths this week! LOL (That’s what I usually do when I can NOT go any further on a card!) I go take a relaxing bath to try and relax and destress about it! I am one blessed with an orginal Amazing Paper Grace friday card. I love the work you put into your card. Well, when my Creativity gets stuck I usually take a break and go lay down and read a book. Not just any book but an adventurous historical romance book :o). Always gets my creativity flowing. Other times I might watch a Youtube video. First thing I do when stuck – sit and look at my supplies and fossick through my NBUS tray and sometimes my ‘promise box’ (I promise I will use these bits one day!) and then discipline myself to use something from one or other, and sometimes both. Love the card. I go to YouTube, or pinterest when I feel stumped. Good morning Becca, wow!!! Less is more!!! Love the colours!!! When I get stuck which is quite often by the way : ) I just walk away and think happy thoughts e.g. loved one’s in my life, places I’ve been, think of my kids and grandkids!!! Works every time!!! Bless you!!! Pretty little card today, so crisp and simplistic. Love the stamped background. When I am creativity stuck, I come to your blog for some inspiration! Without a doubt I find something that I can either use or ‘copy’ to use and get me over the crisis! I love the colour combination, Becca! The card is so elegant and the offset circles frame the sentiment perfectly. And then there’s your blog…. Hello Becca I am so excited to have won last Friaday I can’t believe it ! I am still in shock thank you so much . When I get stuck I come to your blog look at your makes and away I go . of my comfort zone and all juiced up . I try to not go on the net too much as the time it takes I should be creating. When I am creatively stuck, I just sit at my desk, tidy my papers and card, cut a few things out, stamp something and colour it, and although I may not use any of the things that I’ve just done, I find that it gets the juices going. Hi Becca! Love your card! When I am creatively stuck…..which seems to be a lot these days……I go to your blog for ideas! Never fails me! Forgive the above mail I did not read article properly. For me, when I am stuck I go out and do a bit of gardening or look thru’ my cardmaking supplies and make something. When I am creatively stuck I either take a long relaxing hot bath, close my eyes and just plan relax, or that night when I go to bed, play my favorite tunes and visualize my creations! What a sweet card, Becca. I love it, and you’re right – it is a design layout that I will reach for again and again. Thank you for the inspiration! When is a creative slump, I take a walk and look at nature’s colors. When I get back home, I fix a cup of coffee or ice tea and drink it while going thru my box of card samples or notebook of card ideas. Usually, that gets my mojo back. Well I sit down at my craft table and I say to myself if my son was here. (the son I lost in 2014) He would say you can do it mom. So I start putting it together. Beautiful card. Love the clean and simple lines with a beautiful background stamp. 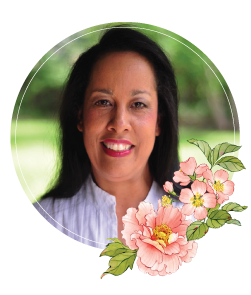 When I get stuck, I have a tendancy to do something outdoors – yard work, go for a walk, or just sit on the patio with tea in hand and enjoy nature. It usually unclogs my mind and that usually works for me. If I still need some inspiration, I start looking at pintrest and web sites. This card is gorgeous. You are so very talented. I am lucky in the fact that i have the Ochil hills out my window, they are the first thing i look at in the morning as they change day by day and hour by hour, so i suppose they are what inspires as it brings back memories from times gone bye for me. Where ever i have lived i have been able to see these beautiful works of mother nature and they have always brought me comfort and a sense of peace. what’s the first thing you do when you are creatively stuck? Hi Becca, This is a stunning card, CAS but oh so elegant. I love it !! When I am creatively stuck, I search Google hahaha, I rely on inspiration from yourself and other fabulous peeps, and I’m always so glad that your creations are always so beautiful and I can take bits out and re-create something beautiful myself. Thank You !! Sickness in my home hav we kept me from posting much of anything. My husband’s heart procedure was even rescheduled but we’re doing a bit better. I love this pretty card. I have the dies you used so I think I’ll give it a try to create my version as soon as I can. I’m very excited about all your wonderful and fantastic cards and other crafts. These card looks so elegant and I like the paper and bow very much.